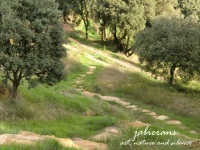 JabierANS is a quiet place in the mountains of Castellón, with beautiful views over the sea. We have built here some spaces in harmony with the environment and now they are available for anyone who needs them. You can come to do a retratment in the individual places, spend some resting time, or inhabit permanently to have the experience of living an annual cycle in nature.